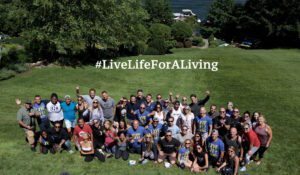 I went to an unbelievable retreat this summer called Live Life for a Living. There were inspiring speakers, cliff jumps into a lake, morning yoga, a private concert with Arrested Development, vegan smoothies, amazing people, the works. 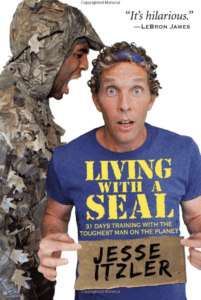 It was organized by my friend Jesse Itzler who has done incredible things in his life like running 100 miles nonstop, serial-entrepreneuring, and hiring a Navy Seal to live with him for a month and then writing a New York Times bestselling book about it. 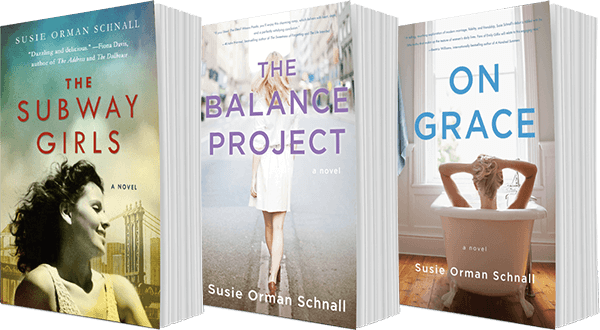 Jesse organizes all kinds of events to get people to live their best lives. And I love going to them because they are always challenging mentally and physically. That retreat was no different. It inspired me to keep living my best life. To not get lazy. To not get too comfortable. The following weekend, I took on another challenge, completing my second Hell on the Hill. This event entails walking up and down an 80-yard hill at 30% incline 100 times. It was no joke. But I finished in under 3 and a half hours, and I felt like a rockstar. 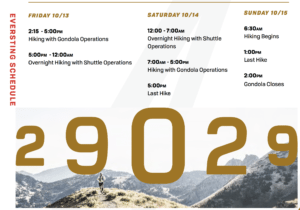 So when Jesse announced he was creating an “Everesting” event called 29zero29, I signed up. Well, to be totally honest, I hesitated: I didn’t really want to do it… it wasn’t a good time of the year for me… blah blah blah excuse excuse excuse. But then I thought about it and realized I can’t not do things like this. I’m strong. I’m well. I’m capable. And if I don’t do things like this when I’m strong, well, and capable then I’m certain I’ll regret it massively when I’m not. Plus, Jesse’s events have all had a theme lately: We Do Hard Stuff. I came away from the retreat, from Hell on the Hill, and from Jesse’s Fitlanthropy monthly fitness challenges repeating that phrase to myself whenever the need arose. For simple tasks like getting out of the shower (it’s so warm) and getting out of bed (it’s so dark and I’m so tired), for harder tasks like doing the “burpee test MF” for the September challenge. And for even harder stuff, too. It’s like a magic mantra. It works every time. So I reminded myself that I do hard stuff and I signed up. Here’s the gist: Climbing Mt. Everest (the real one, in the Himalayas), though aspirational for many is a pretty unattainable quest for most (time, money, skill, etc. etc.). 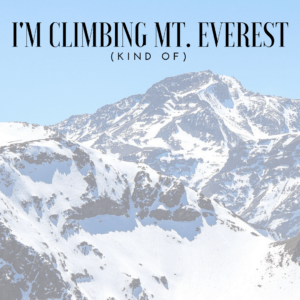 So Jesse decided to come up with a challenge that would be the equivalent-ish of climbing Everest. Hence: Everesting. He rented Stratton Mountain in Vermont. The whole mountain. Along with 150 other crazy people, I will attempt to hike up the front of Stratton 17 times, starting at 2:15 pm on Friday, October 13 and ending at 2:00 pm on Sunday, October 15. Each ascent is 1750 vertical ft. Do that 17 times and it equals the ascent of Everest, which is 29,029 vertical feet. And by “equals” I realize I’m not taking into account the snow, the frostbite, the technical skill required, the lack of oxygen, the dying. 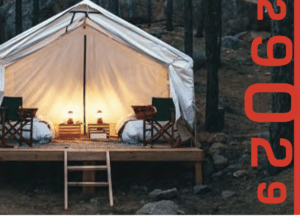 I’ll be staying in a glamping tent village with luxury heated tents, bonfires, bars, bands, food, and entertainment. They’re calling it “Burning Man meets Iron Man.” Fun! I’ve also decided to add a charitable component. For every ascent I complete, I will donate to two very worthwhile charities: The Special Operations Warrior Foundation and The Fresh Air Fund. 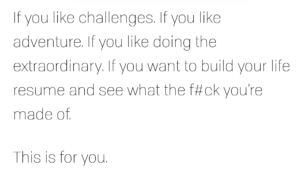 I like challenges. I like adventure. I like doing extraordinary things when I have the chance. I want to build my life resume. And who doesn’t want to see what the f#ck they’re made of.